NYC, 02/12/2019, 7:00PM. 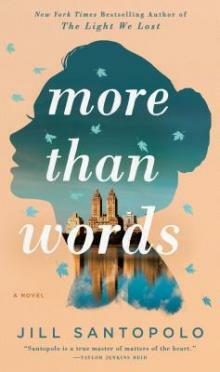 More Than Words: Caught Between the Love of Two Men. From the bestselling author of The Light We Lost comes a tender and moving new novel about a woman at a crossroads after the death of her father, and caught between the love of two men. Nina has always known who she's supposed to be. But is that who she truly is? As her world falls apart, Nina begins to see the men in her life--her father, her boyfriend, and unexpectedly, her boss, Rafael--in a new light. Soon Nina finds herself caught between the world she loves, and a passion that could upend everything. More Than Words is a heartbreaking and romantic novel about grief, loss, love, and self-discovery, and how we choose which life we are meant to live. Jill Santopolo received a BA in English literature from Columbia University and an MFA in writing from the Vermont College of Fine Arts. She's the author of three successful children's and young-adult series and works as the Associate Publisher of Philomel Books, an imprint of Penguin Young Readers Group. Santopolo travels the world to speak about writing and storytelling. She lives in New York City.